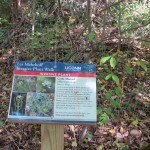 Invasive plants are non-native species that spread aggressively in natural areas. 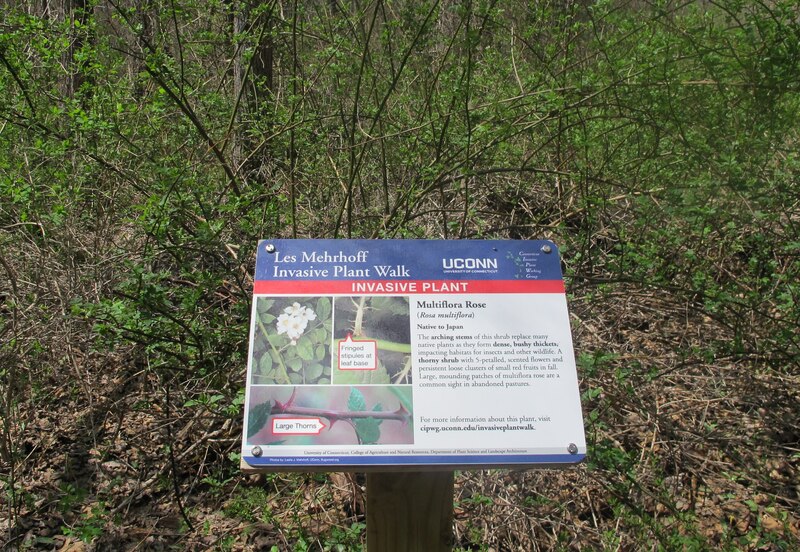 Invasive plants have replaced native species in many different habitats in Connecticut. 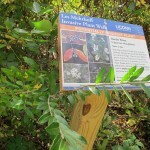 When native plants are displaced, the diversity of native birds, insects, other animals, and plants may be decreased and ecosystem functions may be affected. 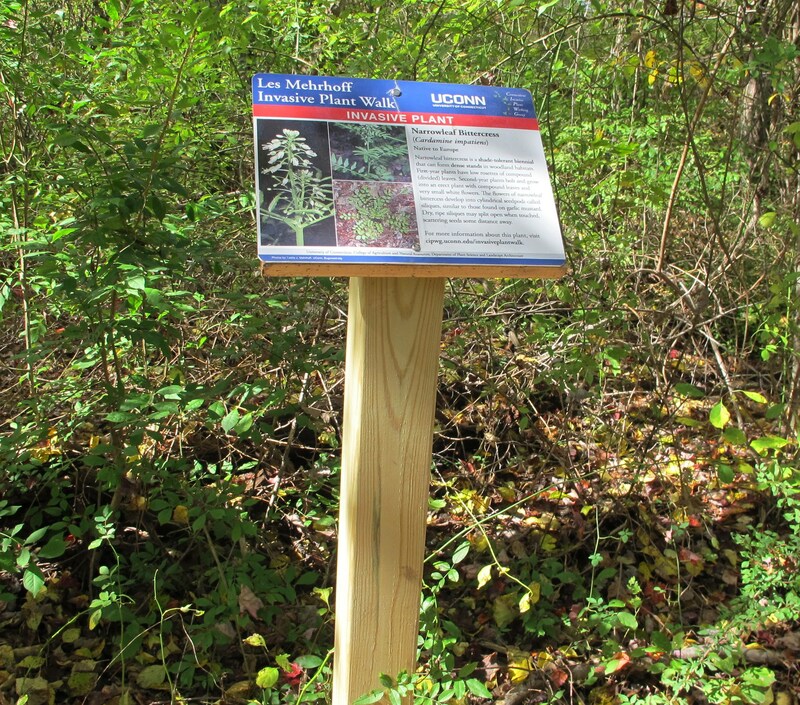 A non-native plants must meet specific scientific criteria to be added to the state list of invasive and potentially invasive plants. 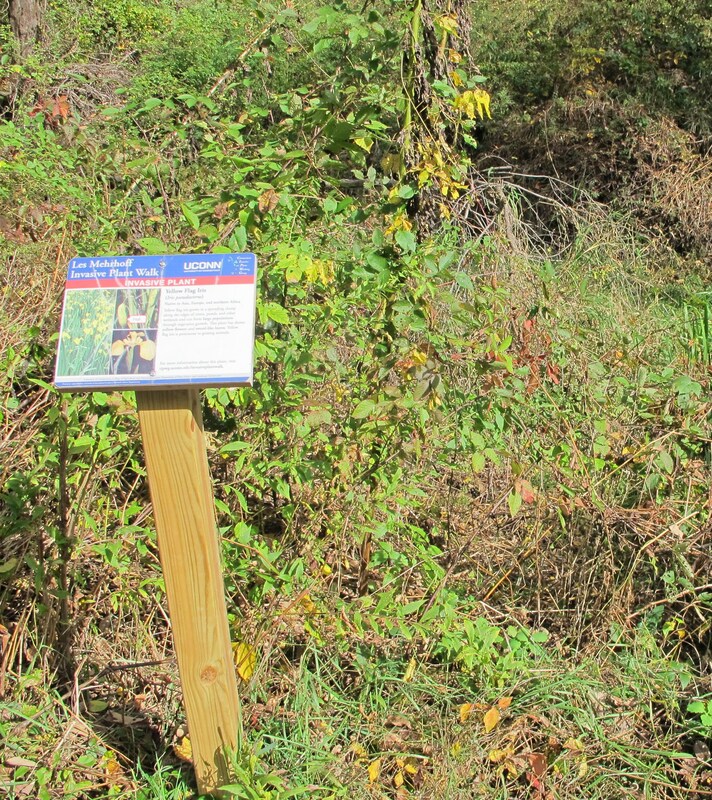 Invasive plants can be spread by natural means, but their spread is also assisted by human activities. 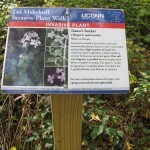 In Connecticut, by definition, invasive plants must be non-native to the state, and most species originate from other continents. 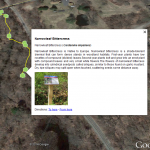 On June 1, 2013, the Connecticut Invasive Plant Working Group, in conjunction with members of the CT Chapter of the Sierra Club, will install 9 invasive plant signs along a trail at the Eagleville Preserve in Mansfield, CT.
Click here to download Google Earth File (KMZ) of interactive tour. 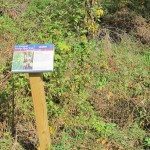 Japanese Barberry is native to Asia. This spiny shrub’s fresh, green foliage stands out in early spring when most native plants have not yet put out new leaves. 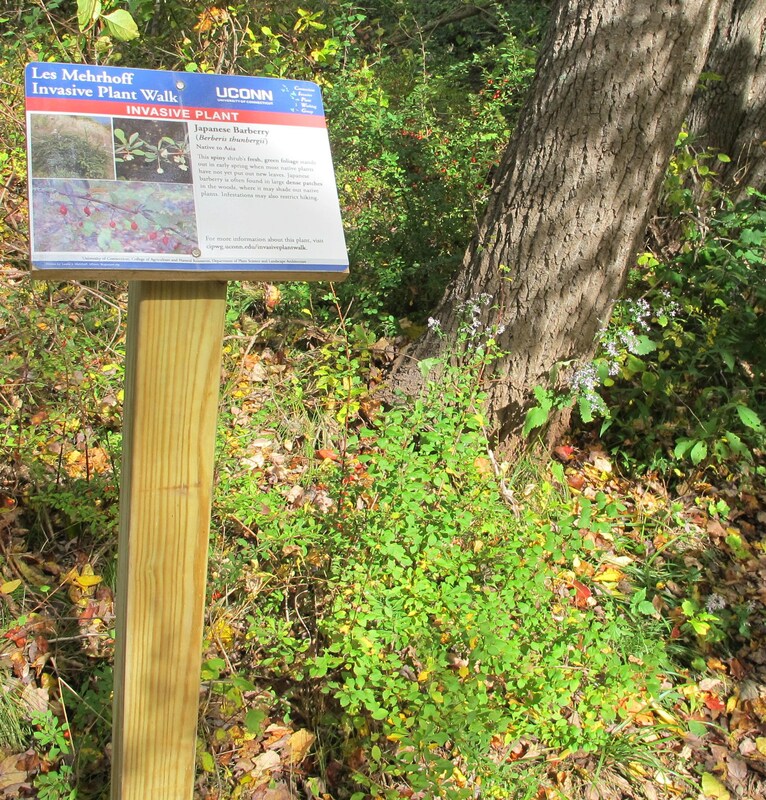 Japanese barberry is often found in large dense patches in the woods, where it may shade out native plants. 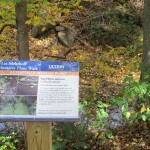 Infestations may also restrict hiking. Pond Water-starwort (Callitriche stagnalis) is Native to Europe and northern Africa. 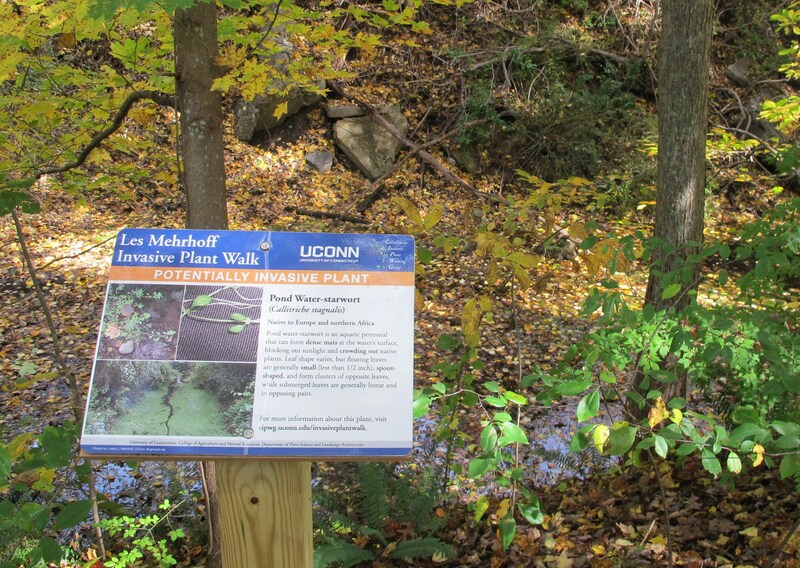 Pond water-starwort is an aquatic perennial that can form dense mats at the water’s surface, blocking out sunlight and crowding out native plants. Leaf shape varies, but floating leaves are generally small (less than 1/2 inch), spoon­ shaped, and form clusters of opposite leaves, while submerged leaves are generally linear and in opposing pairs. Multiflora Rose is Native to Japan. 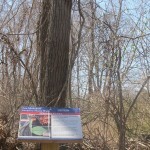 The arching stems of this shrub replace many native plants as they form dense, bushy thickets, impacting habitats for insects and other wildlife. A thorny shrub with 5-petalled, scented flowers and persistent loose clusters of small red fruits in fall. Large, mounding patches of multiflora rose are a common sight in abandoned pastures. 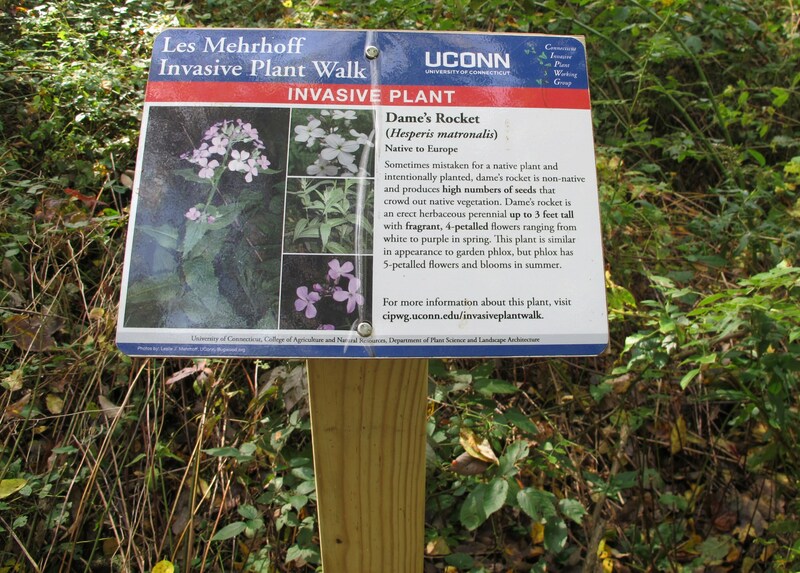 Dame’s rocket is native to Europe. Sometimes mistaken for a native plant intentionally planted, dame’s rocket is non-native and produces high numbers od seeds that crowd out native vegetation. Dame’s rocket is an erect herbaceous perennial up to 3 feet tall with fragrant, 4-petalled flowers ranging from white to purple in spring. This Plant is similar in appearance to garden phlox, but phlox has 5-petalled flowers and blooms in summer. Oriental or Asiatic Bittersweet (Celastrus orbiculatus) Native to eastern Asia. 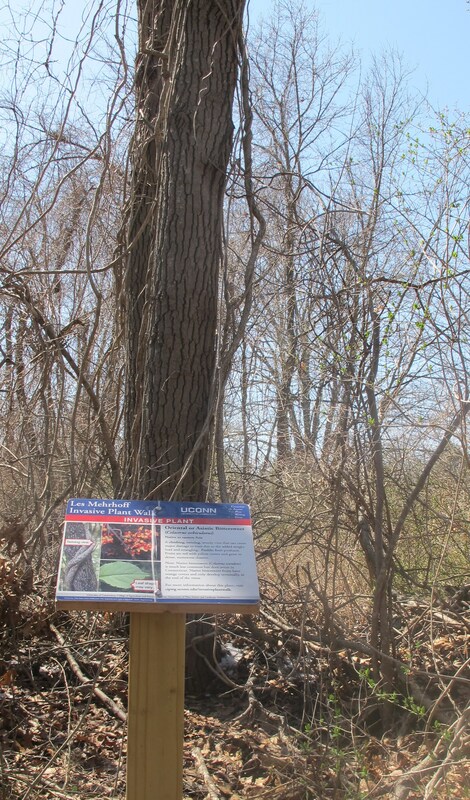 A climbing, twining, woody vine that can cause major damage to trees due to the added weight load and strangling. Prolific fruit producer. Fruits are red with yellow covers and grow in dense, numerous clusters. Note: Native bittersweet (Celastrus scandens) is much less common but does occur in Connecticut. Native bittersweet fruits have orange covers and only develop terminally, at the end of the vines. Border Privet is native to Asia Birds help to disperse border privet across the landscape. 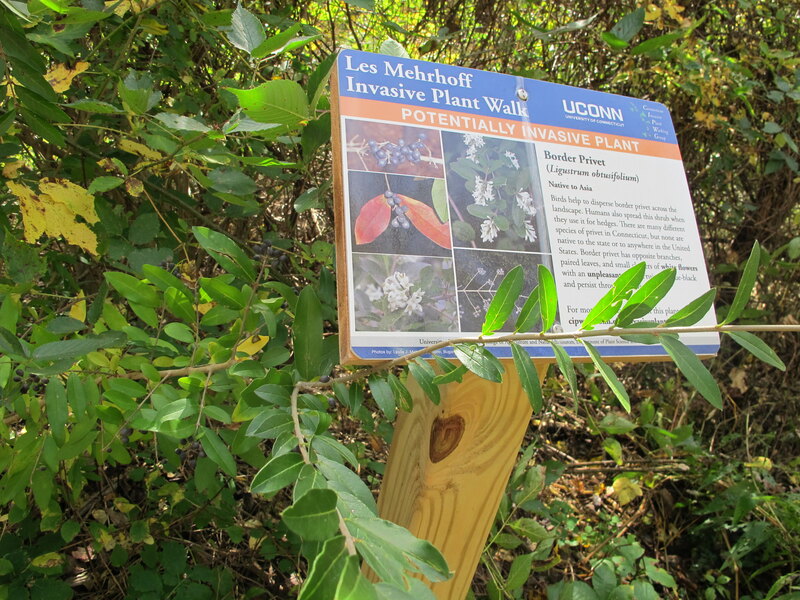 Humans also spread this shrub when they use it for hedges. 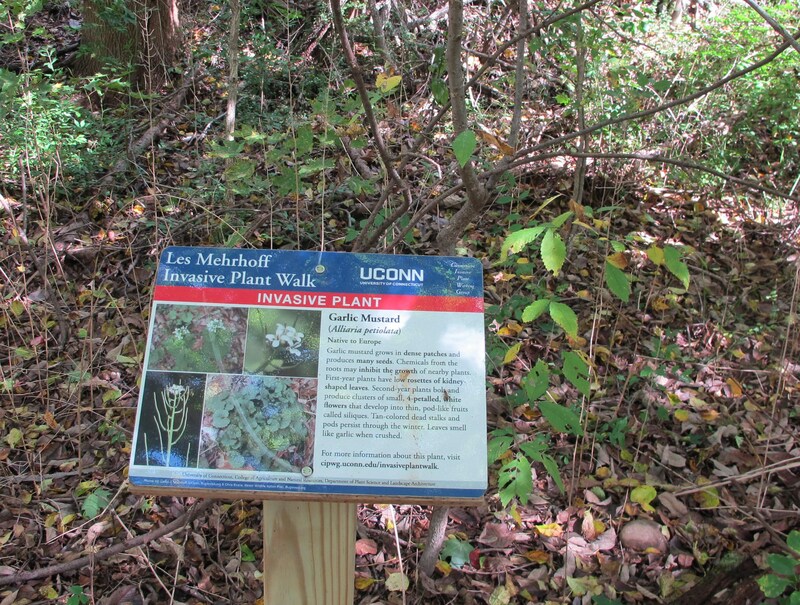 There are many different species of privet in Connecticut, but none are native to the state or to anywhere in the United States. Border privet has opposite branches, paired leaves, and small clusters of white flowers with an unpleasant scent. Fruits are blue-black and persist through the winter. Narrowleaf Bittercress is Native to Europe. 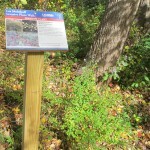 Narrowleaf bittercress is a shade-tolerant biennial that can form dense stands in woodland habitats. First-year plants have low rosettes of compound (divided) leaves.Second-year plants bolt and grow into an erect plant with compound leaves and very small white flowers.The flowers of narrowleaf bittercess develop into cylindrical seedpods called siliques, similar to those found on garlic mustard. Dry, ripe siliques may split open when touched, scattering seeds some distance away. Yellow Flag Iris (Iris pseudacorus) Native to Asia, Europe, and northern Africa Yellow flag iris grows in a spreading clump along the edges of rivers, ponds, and other wetlands and can form large populations through vegetative growth. This plant has showy yellow flowers and sword-like leaves. Yellow flag iris is poisonous to grazing animals. 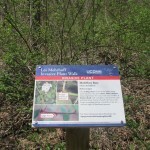 Garlic Mustard is Native to Europe Garlic mustard grows in dense patches and produces many seeds. 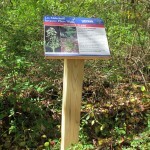 Chemicals from the roots may inhibit the growth of nearby plants. First-year plants have low rosettes of kidney­ shaped leaves. Second-year plants bolt and produce clusters of small, 4-petalled, white flowers that develop into thin, pod-like fruits called siliques. Tan-colored dead stalks and pods persist through the winter. Leaves smell like garlic when crushed.